Kaavadiyattam is a folk art performed as an offering to Lord Subrahmanya. The word meaning of Kaavadiyattam is ‘dancing with Kavadi’. The dancers are dressed in yellow colored clothes and smear ashes all over the body. They carry a Kavadi on their shoulder which is a large bow and the devotees then dance in a row to the music made by the beating of Chenda. The other instruments used are Nadaswaram and Udukku. It originated actually in Tamil and now this dance is common in the Subrahmanya temples in Kerala. There are different types of Kavadis based on the items decorated on them. If the Kavadi is decorated with peacock feathers it is called as Mayilpeeli kavadi. Peacock feathers are used with the belief that peacock is the vehicle of Lord Subrahmanya. 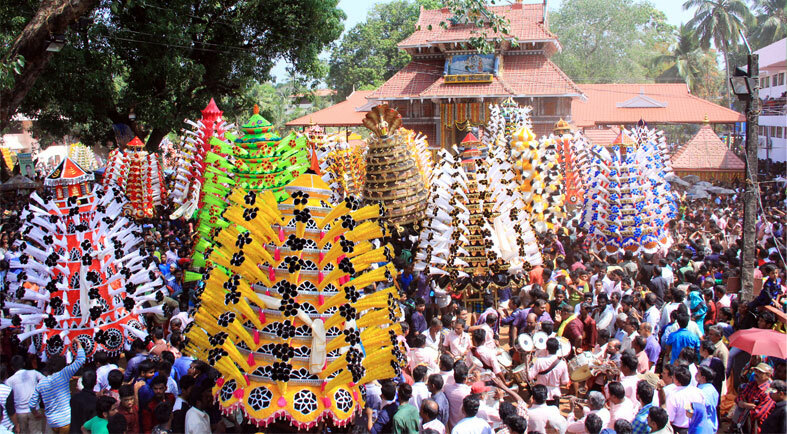 If the Kavadi is decorated with various colored flowers and papers, it is called as Pookavadi and Ambalakavadi is a Kavadi which is shaped like a tower of the temple. It is a great sight to see the dancers with Kavadi twisting and turning in a row to perform the Kaavadiyattam.